Journeys of heart and mind: What's the purpose of the Scilla blog? Most blogs focus on a particular topic, but this one covers all sorts of topics. One reason for this is that to post enough items to keep a blog interesting takes time. Posting to two or three more focused blogs would take two or three times as much effort, otherwise they would be updated two or three times less often. I have lots of interests, lots of stuff to share. I want this blog to reflect real life, I want it to be a way for my friends to keep track of what I do and also perhaps an introduction to areas of my life they might know little about. Do you compartmentalise your life? I do. Not deliberately, but when I'm with scientists we talk science, when I'm with Christians we talk faith, when I'm with photographers we talk about images. It's natural. To help you I've provided a tag cloud at the top of the left hand column, click on topics that interest you and you will only see posts on those topics. Over the next few days I plan to begin posting brief introductions to each of those topic areas explaining why I'm interested, what it involves, and how it affects my life. These are not going to be technical posts, they'll be light and easy to follow - for anyone. I promise! Have you ever thought that there must be connections between all the different things you do? If in no other way they are linked because they're all things you enjoy, or else you do them because something else about your life demands it. Either way, there's a link. I'll try to draw out some of the links I see as I go along. Some are clearly linked, like astronomy and photography, or photography and garden, or transport and environment. But what about garden and persecution? I plan to work through in alphabetical order so I'll be starting with astronomy and working right through to underground church. These posts will be interspersed with others. There are bound to be items just waiting to be written on a host of other things. i want to ask why you named this blog "the scilla blog" .... my name is scilla, and i find very few others with that name. How did you pick it as your blog name? Hi, is Scilla your surname or your given name? The reason I called my blog by this name is because my wife and I are both very fond of the bluebells that grow in woodlands in England. We also have a lot of bluebells in our garden, they make a blue carpet in late spring and have an amazing fragrance. When we were looking for a domain name we wanted to use the bluebell theme, we chose 'scilla' because it's one of the Latin botanical genera of bluebells and because scill.org.uk was available to register. 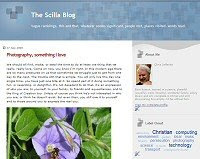 So when I created the blog it became blog.scilla.org.uk and I called it 'The Scilla Blog'. I discovered that Scilla is also the name of a town in Italy. It's my given name, and in fact, I'm named after the flower!